Looks like I spoke too soon. Son's PC gets to character creation screen but disconnects upon trying to enter world. Anyone have any ideas? I uncommented these 2 lines in eqemuconfig.ini and set the IP's to my machines LAN IP. son can now log in and play. [Error] Handle_NewLSInfo error, remote address was null, defaulting to stream address 127.0.0.1.
when starting the login server. 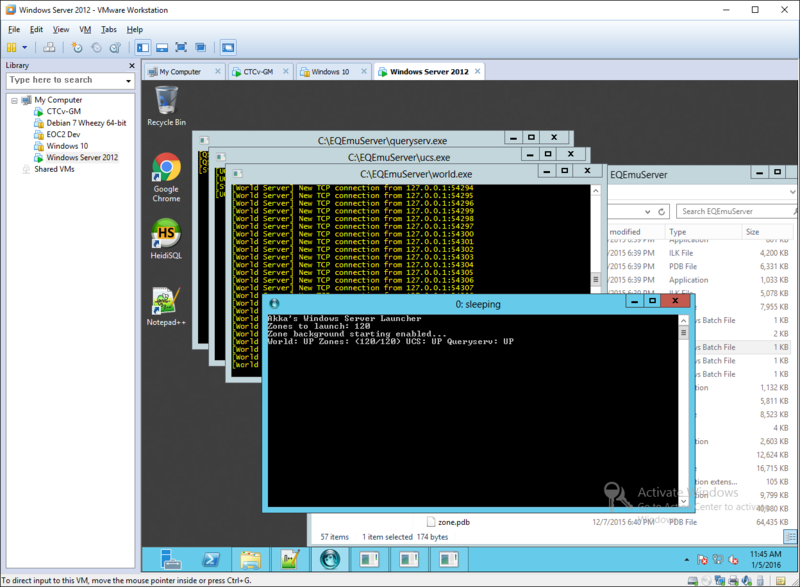 Everything works great on Windows 2012 R2 server with full features. Quick observation so far. Looks like I can enable 100 dynamic zones no problem. But there is a weird loop I am seeing with more than 100 where it cannot fire off UCS or Queryserv and never finishes loading zones. The other observation is the DB seems to be Halloween event enabled! Is there a way to easily disable the Halloween event? How often will the source executables be updated and option to pull executables that have bots enabled? I'm going to guess that this is probably because you're running out of memory? I'm not sure how to disable the PEQ Halloween event offhand. Executables will be updated periodically when safe, a bots executable will be on its way eventually. Test server has plenty of memory. It almost looks like its a scripting issue, but not sure. Really not sure what your problem is. I've tested with 200 dynamics before using my launcher I wrote without an issue. If you could help me understand what you're seeing better maybe I can fix it for you. Running great on my windows 10 x64 machine. Anyone figure out how to get rid of the Halloween events that are live in this database version? Any help is appreciated, thanks. Is there a way within the "win_server_launcher.pl" to boot specific zones or call the database table that holds specific zones to be booted? I tried with 120 dynamic zones and it works, I will push it up to see. If you would like to log into my server to see whats happening send me a PM. I didn't know how to edit to remove all the elements of the Halloween event. I noticed in the script you were pulling down the daily dumps. So I got the current DB and used it instead. Although knowing how to enable and disable the halloween event would be kewl! PS. I am liking this running on windows more and more! Thanks for creating this! In order to shut off Halloween you will need to pull in a fresh copy of the PEQ database after tonight. Cavedude has to run a custom script to disable it. Last edited by Akkadius; 01-08-2016 at 02:47 AM..
At the end of the SQL code to disable the halloween event, is that an update to the windows launcher .pl to launch specific zones? **Edit: I see that must be the Halloween event zones. The stock launcher settings have no effect on the launcher that I've created. So I tried installing DBI via the PPM and I am getting a 401 Unauthorized error. Apparently for Perl 5.12 you need a business edition license to install these packages for Perl 5.12. Am I wrong about this? How do I go about getting DBI installed? Am I going to have to get the source and install it that way? I did use the installer. Sorry I took over Eriviyn and one of the scripts wasn't working with the plugin::LoadMySql call so I was thinking DBI wasn't installed. I apologize, it seems it's another issue altogether. DBI is definitely installed. When you run the script from console you'll know cause Perl will say whether or not it can load DBI.